What did you do to/with your 996 today? Re: What did you do to/with your 996 today? Had a productive weekend in the garage! Installed new headlight tray (old one had plug bracket broken, so I had to pull wheel liner each time removing light), and installed a new turn switch assembly. Mine has the OBC, but I bought a three stock (significantly cheaper than 4 stock), and transferred my OBC stock over....piece of cake. HUGE thanks to gnat for a great DIY write up! Had to replace the #2 post-cat O2 sensor. Durametric showed it dead. Surprisingly easy on this one. Only had to remove airbox and work around the engine brace with a crow’s foot. Will put the other new ones in tomorrow, when I put the car up, so they all have same T=0. Did some cleaning around the engine bay. Since it was still sleeting outside - everything around our place is a sheet of ice - I worked inside with artifical light; one of those Bell & Howell LED "light bars" . It'll be interesting to see what it looks like in actual daylight...which may be sometime in April. I hate this climate. Had to oil the bearing on the air injection pump. It's been about 1.5 years since I touched it. Only took about 5 minutes this time. With a few pics, that would make a good DIY for some of us 'challenged' individuals. Replaced my 2.5 year old wiper blades with the new Bosch Icon X's. I went with 22A and 21B; perfect fit. They look cheap though...I prefer the Denso Low Profile wiper blades I just put on my GF's lexus. They work, but the previous set fit better. The passenger side needs to be curved to sit properly. 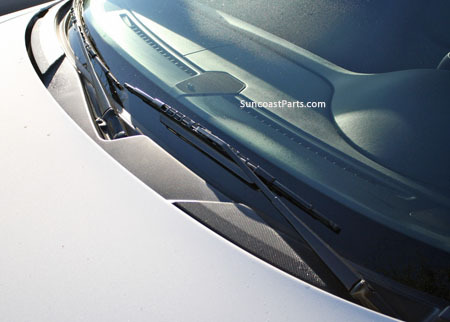 Since the Icons aren't curved, the last ~3" of the wiper blade don't actually touch the glass. You can see how the oem passenger side blade is not straight. The last time I did it, I lived in an apartment so I did it in my friend's garage. Used some mobil1 spindle oil that he kept for his mill. This time I used a gun lube I had laying around. The bottle had a nice needle dispenser, so that made it easy to oil the sealed bearing. Fingers crossed the bearing doesn't blow up, sending metal shrapnel into my engine via the air pump causing total failure!